I had a craving for a curry dinner. Not a very pretty dinner, but very tasty. 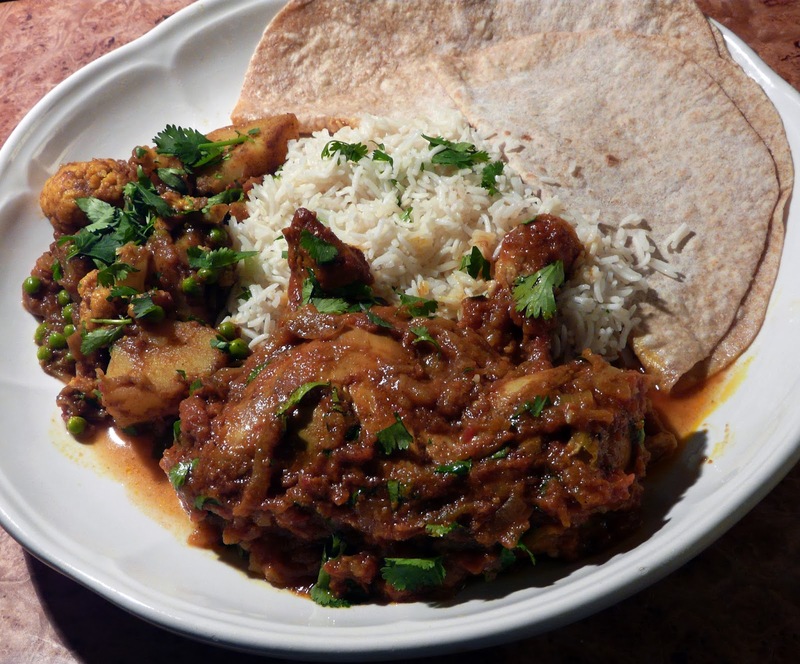 Chapati is easy to make and really is a great accompaniment to curry. minutes over low heat. Do not burn. tender. Serve with Basmati rice and sprinkle with fresh cilantro. Adapted from Classic Indian Cooking. Optional: Add a cup of frozen peas a few minutes before serving. until golden, add garlic and cumin seeds. Cook for a minute or two. Note: Recipe can be adjusted. Just keep the ratio of whole wheat flour and all purpose flour at 2 to 1.
ie. 1 cup whole wheat, 1/2 cup all purpose. Place flour in food processor and add salt. Mix well. Slowly add warm water and process until flour forms a soft dough. dough rest for at least 30 minutes. to 24 depending on size. Dust with flour and cover with plastic wrap to prevent drying out. Roll each ball into a thin 7 to 8 inch circle. will puff up. If you don't have a gas burner then skip this process. oven to keep warm while you cook the remaining Breads. Aloo Gobi is one of my favorites! Thank you for the recipe....Your entire meal looks perfect to me! You are right a chapati is best when eating curry! Only in the last few years, have I overcome my aversion to curry. I especially love red curry, because I love Thai food. 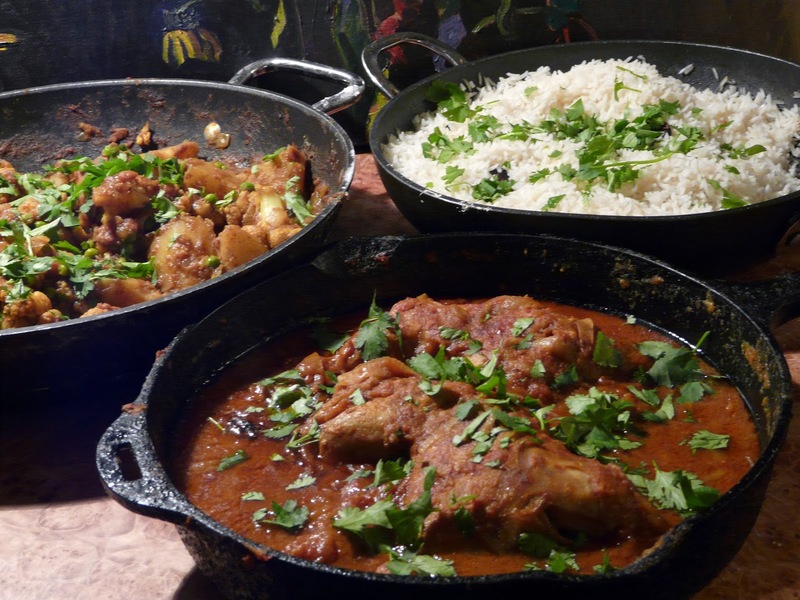 My husband adores Indian food, and I'm on the hunt for recipes that I can make for him. I think each of these dishes look great, and I've never heard of Aloo Gobi. I'm still learning about Indian cooking, as you can tell. By the way, I've pinned some recipes for making naan bread on a pizza stone. It might not be exactly like the real deal, but I'm willing to give it a try. Debby, I've tried making naan on a pizza stone, and you get a decent bread, but it doesn't taste like the Naan baked in a Tandoori oven. I might try one more time using the same method that I have been using recently to bake pizza. A combination of stone, high heat and broiler. Your photos are making my mouth water, Ann. I love Indian food but don't prepare it at home very often. Thanks for the recipes. Can't wait to try them. I had so many thoughts about this post. Your photos look wonderful. I have the most difficult time photographing brown food. I just made curry cauliflower, but now I want to try yours. I love naan, but if you have issues I won't even try. Tandoori ovens makes all the difference. You are making me hungry.